What defines a home? The materials it is made out of, or the human experiences that happen there? 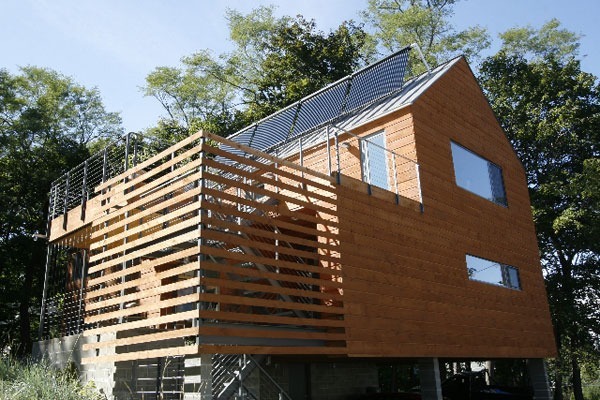 An energy-efficient house appeals to a person’s rational side. It does more with less. It requires less energy, thereby reducing the burden on the owner of securing, paying for, and shouldering the consequences of that supply … Working among the various ideas surrounding sustainable architecture, we came to the conclusion that energy use should be the primary measure of whether a house is “green” or not … An energy-efficient house’s savings over its lifespan CAN outweigh all other choices a person makes regarding energy use. The architecture facilitates a way to sit and read, to observe the outdoors beyond, to enjoy the sun … The Emotional house concept as we perceived it … was built on favorite moments in houses and apartments we lived in, exciting features we came across in houses of friends we visited. It was the settings of our most emotional memories, indoors and out, the places that served as the backdrops and stage sets for the actions of people. It was angles of sunlight in the morning and afternoon, the warmth of a kitchen. The keys to a successful solar space heating system are a super-insulated building envelope, excellent southern exposure, and low temperature distribution (i.e. radiant floors vs. radiators). The Weiss’ included all of these aspects in their design, with R values of 50-58 throughout the structure and a perfect southern orientation on their home (which also helps with the Emotional side of the house – providing ample sunlit areas to work and live during the day). Due to the high insulation value, the heating needs of the space are low, which means that solar thermal is viable as the home’s primary source of heat. In deep winter, when the sun is at its weakest and the heating needs are at their highest, the energy gap is made up with seamless electrical backup, as well as locally harvested wood. The great part about solar hot water space heating is that the same system provides all of the home’s domestic hot water. The system we designed and installed consists of a 120 evacuated tube hot water array tied into two solar hot water storage tanks. When the temperature at the collectors is hotter than the tank, the pump begins to circulate a non-toxic food-grade antifreeze solution through the collectors and into the heat exchange coils in the storage tanks. Should there not be enough sun to heat the domestic tank to its set point, the integrated electric element turns on and provides automatic backup. When the sun shined, our solar array made hot water, even when it was 15 degrees Fahrenheit outside. We were thrilled to be so warm. Yet, the Rational House’s performance in the winter conditions told half the story of our satisfaction with it. The Emotional House was the one we really lived in, wrapped inside an energy-efficient super-insulated rational shell. Learn more from their profile of the 57 Union St, Belfast home, or see Locative DRD’s website. You don’t essentially need a ton of pricey gizmos to comprehend the benefits of passive solar heating systems. Passive heating collects and guides heat without the assistance of almost any mechanised or electric powered gear .